I’m on a boat! I’m on a Boat! This weekend started with Price and I finishing the first disc (episodes 1-3) of the second season of Big Love. I love Netflix and Big Love! We love to hate Nicki and we think Rhonda is amazing! In the midst of all the Big Love watching I made a cake for my stepdad’s birthday. I made a double batch of “Over The Top” Chocolate Layer Cake and Classic Chocolate Buttercream from my favorite baking book. I have made some tweaks to the recipes because I have a convection oven but it is a fantastic book. 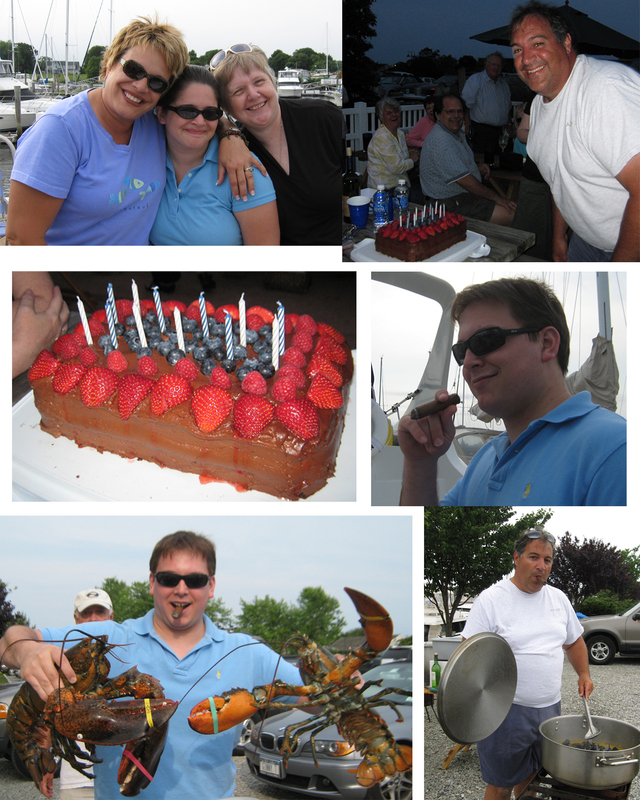 The dock had organized a lobster bake that consisted of pot luck sides and over 40 lobsters. Once dinner was over I brought out the cake and we all sang Happy Birthday to Richard. While eating dinner I was talking to a genius of a woman who said that essentially the marina is like an expensive trailer park. Genius! Just genius. She is right. Instead of trailers people have boats that they sit out on while you watch a fat man running around without his shirt on, people getting drunk (mid-day), kids screaming and running around, etc. Not to mention my need to watch NASCAR on the back of it. Oh how I love night races on the boat…. While I love being at the boat I will never look at it the same again because of her. Thank you! Sunday wrapped up the weekend with some outlet shopping (yay new JCrew dress and flippy floppies) and our trip back to Boston. While I should have been doing laundry and food shopping we opted to watch Role Models instead. I love Ronnie. That little kid had a great delivery. Must watch.